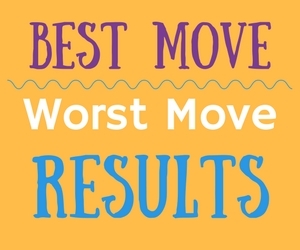 Every Monday, we will be posting the results of our BEST MOVE/WORST MOVE poll from the latest episode. Here’s how YOU voted! At tribal council, Kellyn threw her vote onto Donathan in order to save herself. Although she ended up getting voted out anyway, she did force a tie initially and nearly escaped the vote. She did the best she could under the circumstances and went out swinging. The poll results were close, with “Wendell supporting Laurel in her immunity win” as a close runner up, but ultimately the former move by Kellyn was voted Best Move last episode. Donathan’s initial plan to blindside Wendell was smart, but Donathan started unraveling his game by telling Wendell and Domenick that he doesn’t feel comfortable in their alliance anymore. This was voted the Worst Move by players. The worst move ever was when YOU changed the point structure AFTER people already voted last week! I used all 10 points after the show last week, then some time after that you changed it to 30 points… totally crewing me.